Project Sisu and Pro Bono Publico have joined forces to produce the Lifetime Care and Support Scheme’s first newsletter. The Scheme provides ongoing support to people who have been seriously injured in traffic accidents. The biannual newsletter, named Shine, aims to share stories and information across the Scheme’s network of participants and their families. A feature of the first 2012 Autumn issue, is the story of Brock Warren. In late January, I had the privilege of travelling to Tamworth, in north west NSW, to interview Brock and his parents, Debbie and Robert. 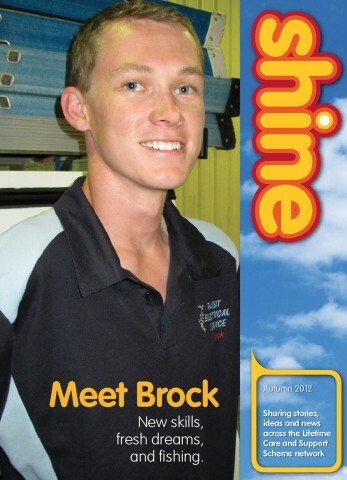 A recently qualified electrician, Brock had been working in his family’s electrical business in Tamworth. When not at work he loved riding his Yamaha R1 motorbike on the open roads of the New England plateau. On Father’s Day, 5 September 2010, he left a mate’s place and was heading home. In a moment he lost his balance, and the rest is a blur. The Yamaha was written off and Brock ended up in Tamworth Base Hospital with severe injuries, so intense that an airlift to Royal North Shore Hospital (RNS) in Sydney was immediately commissioned. Arrival at RNS, with mother Debbie at his side, revealed a string of injuries – broken C6 vertebra, burst C7, broken T1, T2, T3 and T4, punctured lung, broken shoulder blade and collarbone, and deep gouges out of his knees and elbows. Brock’s injuries were so severe that doctors prepared his parents for the prospect that he may never walk again. He was subsequently diagnosed with an incomplete spinal injury, encouraging Brock and his family to hope that some mobility might return. After seven weeks in the Spinal Unit, he went home to Tamworth. Since then, he has regained considerable mobility, and is back working as an electrician in the family business.